I was pleased that the French restaurant that was previously located at the site where Cannons Fish and Chips Restaurant in Southgate now stands is long gone. A selection of restaurants already line the stretch on Cannon Hill where this new restaurant has opened and Cannons Fish seems to have created a good following with many of the locals popping in for a take away or eating in with friends and family. We went along initially to try the restaurant with the children but on being informed there was no cod left on our first attempt we went elsewhere. Our second attempt to try the food here was far more fruitful thankfully. 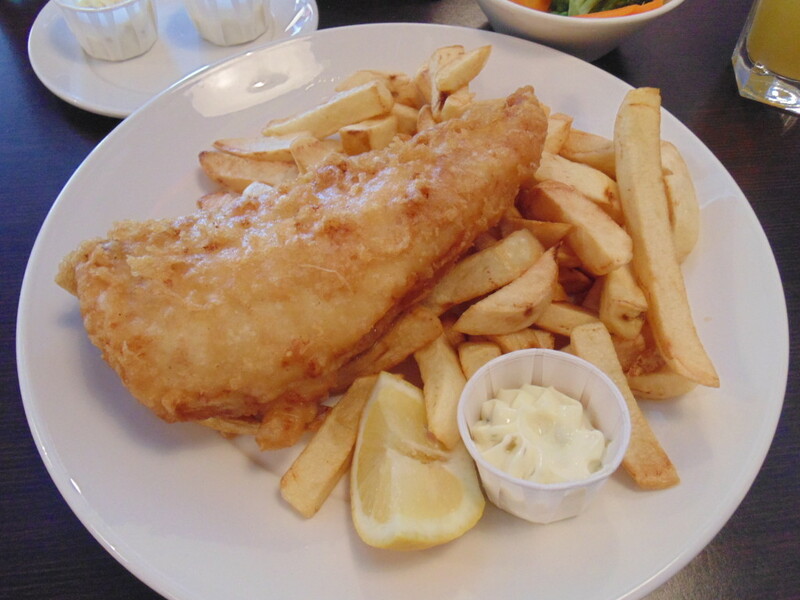 I had a craving for Fish and Chips so I grabbed my husband who didn’t mind in the slightest, dropped off the already stuffed little ones to a relative’s house and drove to Southgate so we could finally try the food at Cannons Fish. How exciting!!! The staff were helpful although didn’t seem to smile much. We were there at about 18:15 so nice and early for dinner as we had to make sure that the children were back home in time for their bedtime. We placed our order and chatted whilst we waited. It didn’t take long for the food to arrive and we tucked in hungrily. I noted that the batter was exceptionally crunchy and not excessively greasy both good signs. The pieces of cod were lovely and chunky and moist. The fish and oil it was cooked in were fresh which was obvious from the first taste! The portion of chips seemed a bit small considering the price and the portion sizes at other local Fish and Chip Restaurants. There was also a marked difference in the size of the piece of fish that was served to my husband and what I was given. Mine seen in the picture was considerably smaller which didn’t seem fair. I didn’t manage to get a photo of his as by the time I had taken one of mine he had devoured half of it already! In his defence he was very hungry having had no time for lunch. There was a steady que forming for takeaways whilst we sat and ate. The more organised of the customers and repeat customers had clearly phoned through their order before arriving to collect it. The tables didn’t remain empty for long either and having now tried their food I am hardly surprised. The menu range is good, not too small and not excessive so that it takes ages to select what you want. There is also a kids menu which I plan to eventually try too. This is a nice clean restaurant, always good to know when food is involved and the food is really worth trying but as with all food it’s best when eaten at the restaurant so book your table to make sure you get a space (maybe check they have the fish you want too). It’s fabulous when you find a good restaurant. LOVE fish and chips! Living by the beach we eat a fair few I tell you! I love fish and chips – this sounds great! Love crispy batter! It was very well made and fresh tasting. One of the best I have been to.